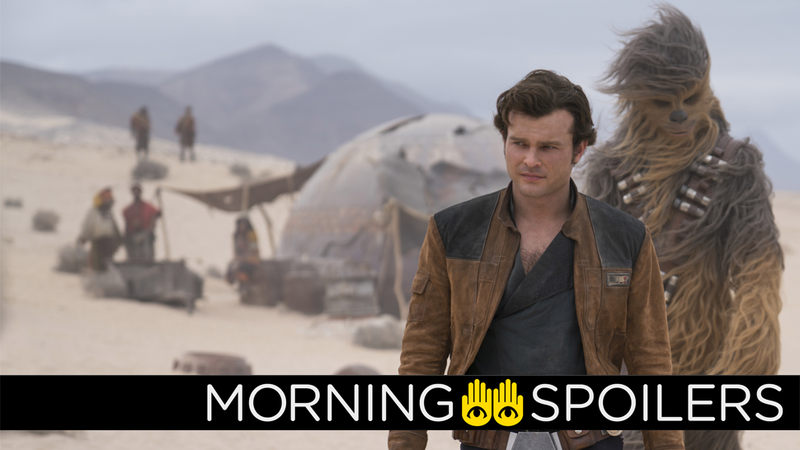 Han and Chewie probably won’t be bumping into a certain Bounty Hunter in Solo: A Star Wars Story... as far as we know at least. The new Pet Sematary adaptation has found a star. The Russo brothers just won’t stop teasing the ominous importance of Avengers 4's real title. The Vampire Diaries’ Ian Somerhalder heads to Netflix for even more vampiric shenanigans. Plus, new looks at the cast of Cloak and Dagger, and new footage from Deadpool 2, Supergirl, and iZombie. Spoilers, punch it! Empire has some new pictures, including an interesting one of Paul Bettany as Dryden Vos, “a facially-scarred ‘big-shot’ criminal overlord who recruits a crew of reprobates for a heist.” Note the samurai-esque Mandalorian armor in the background, previously seen in the blurry background of a set photo from Ron Howard, which had some believing Boba Fett could make an appearance in the movie. He still could, of course, but now we know that this set of armor is specifically is not Fett’s. The magazine also has an image of Han, perilously hanging off the side of the Conveyex train (start your “Han Dies in Solo: A Star Wars Story” rumors now!) on the snowy world that’s been a huge part of the two trailers, and which finally has a name: Vandor. THR reports Domhnall Gleeson is in “final negotiations” to play Gabriel O’Malley, “an intense Vietnam vet who works for neighborhood gangsters as a hitman before skipping town” in Andrea Berloff’s film adaptation of the comic book from DC/Vertigo. In a recent interview with Yahoo UK, Joe Russo stated “it will be quite some time” after the release of Infinity War before the official title of Avengers 4 is revealed to the public. We have three new “Walking Deadpool” TV spots from Sunday’s season finale of The Walking Dead, that are mostly old footage, but there’s a few new shots in there too. Film School Rejects has an exclusive clip from the upcoming horror anthology hosted by Martin Freeman, which appears to include haunted diapers. The season finale is titled “Life Sentence”, according to Spoiler TV. A delusion ends in disaster, apparently, in a cryptic synopsis for May 15’s episode of Legion. In a recent interview with Indie Wire, co-creator Matt Sazama revealed he’s already writing scripts for a second season with co-showrunner Burk Sharpless. We are working on scripts and hoping that, if we get a green light, we’re ready to go. We’ve had a lot of thoughts about it, and hopefully, if everyone watches it, we’ll get to see more adventures of the Robinsons, because we do have some crazy stuff planned out that we really hope we get to film. Entertainment Weekly has character portraits and descriptions of the show’s cast. Click through for more, and to read up on Tandy, Tyrone, and company. The site also confirmed that Emma Lahana’s character is Detective Brigid O’Reilly, a character from the comics who starts out as a police officer settling into an uneasy relationship with Cloak and Dagger acting as vigilantes in her precinct, only to be transformed by a gas attack herself into the toxic vigilante Mayhem.